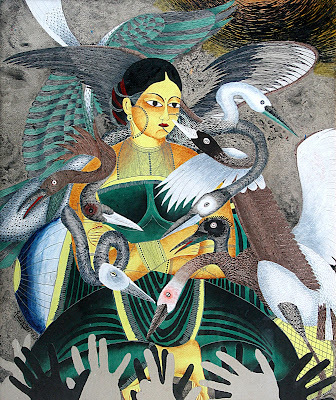 A profusion of birds on artist Pulak Ghosh’s canvas greet the viewer, as he contemplates on the best possible display for his paintings. In Bangalore, with his recent series of works, Pulak has studied fine arts at the Rabindra Bharati University, Kolkata. Born in 1954, he has been a part of several shows but this is his first solo in Bangalore. This latest series of works is titled ‘Entanglements’ and it stands for a lot more than just the tangling of the long necks of the cranes (birds that are seen along the west coast of America). At the first instance the theme somewhat surprises with its simplicity and its apparent decorative quality. But, a closer look reveals more elements - the overlapping of the traditional with the modern, the dormant violence and the exquisite detailing. In reality, these white and grey birds with their elongated necks entwine and suffocate each other with their intensity. The artist has attempted to highlight social and political deceptions. The difference between perceived reality, delusion and the truth will always concern us and it is this very aspect that Pulak attempts to compose on his canvas. Outstretched hands dominate the lower part of the canvas; the black and white palms denote the diverse human traits. Often, basing his protagonist on the Kalighata patas and combining them with the elegant birds he creates an unusual and unlikely pictorial language. The colourful folk art and the elegance of the pure white birds contrast and complement interestingly. Similarly, the elaborate detailing on the birds stand out against the solid blocks of colours found on the protagonist. He also has acrylic and ink drawings on paper and a few works in vitreous enamel.